Big Al's Pizza - Rowville uses their own specialised couriers to deliver their food. 1x Large Pizza, 1 x Large Garlic Bread Roll, 1 x 1.25L Soft Drink. 4 x Large Pizza, 1 x Large Garlic Bread Roll, 1.25L Soft Drink. 11 inch base with olive oil, sprinkle of salt and herbs served with balsamic vinaigrette, sweet chilli sauce and tzatziki dipping sauces. 5 strips served with chips and choice of honey mustard or BBQ sauce. 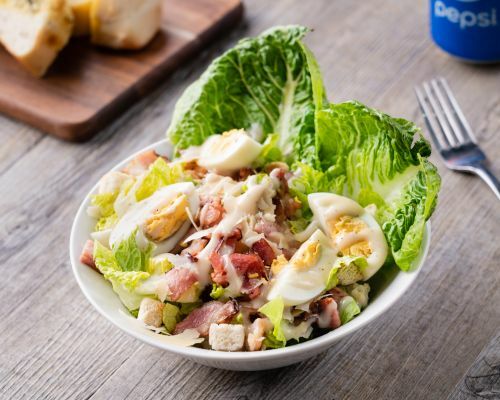 Lettuce, bacon, egg, croutons, anchovies, parmesan and dressing. Mixed Lettuce, tomato, cucumber, Spanish onion, strips of pan-fried chicken, special dressing. Chicken breast, mango, salad mix, cherry tomato, Spanish onion, cucumber, dressed in mango sauce. Mix lettuce, tomato, cucumber, Spanish onion, olives, feta cheese dressed in balsamic dressing. Crumbed calamari served with chips, lemon wedge, tartar sauce. Corn chips with mozzarella cheese, spicy salami, red capsicum, sour cream, guacamole and salsa sauce. Special fries with mozzarella and bacon. All meals served with chips and the choice of Italian salad or vegetables. Tiger prawns in a creamy white wine garlic sauce served on a bed of rice. Virginia ham, mozzarella cheese, napolitana sauce. Schnitzel with lemon wedge and tartar sauce. Crumbed assorted seafood served with chips, lemon wedge, tartar sauce. Chicken breast served with bacon, cherry tomato, mushroom in white wine cream sauce. All pizzas have a tomato base with cheese on top! Traditional, Deep Pan or Thin Base available. Small - 9 inch, Medium - 11 inch, Large - 12 inch, Family - 15 inch, Jumbo - 18 inch. Available for Halal orders. Ham, hot salami, mushrooms, onion, prawns, anchovies and garlic. Roast chicken, freshly cut tomato and oregano. Ham, beef, chicken, hot salami, bacon and BBQ sauce. Al's choice plus bacon, pineapple and anchovies. Roasted chicken, onion and BBQ sauce. Ham, hot salami, mushrooms, onion, capsicum, prawns, olives and garlic. Ham, mushroom, salami, onion, chicken, beef, garlic and oregano. Fresh chicken, onion, peppers, sweet chilli sauce. Fresh chicken, onion, peppers, corn kernels. Peanut butter base, mozzarella cheese. Mince beef, fresh sliced tomato, onion, bacon, egg. Hot salami, mushroom, onion, capsicum, jalapeno, hot chilli flakes. Mince beef, onion, bacon, BBQ sauce. Hot salami, mushroom, pineapple, olives. Capsicum, minced beef, spicy chicken, salsa sauce, chilli. Chicken, mushroom, onion, capsicum, prawns, olives, garlic. All pizzas have a napoli base with mozzarella cheese! Traditional, Deep Pan or Thin Base available. Small - 9 inch, Medium - 11 inch, Large - 12 inch, Family - 15 inch, Jumbo - 18 inch. Shaved Virginia ham, mushroom, Spanish onion, kalamata olives, mix of ricotta and bocconcini cheese. Smoked chicken, mushrooms, Spanish onion, ricotta cheese, served on a BBQ sauce. Tiger prawns, sun-dried tomato, mussels, calamari, garlic, bocconcini, herbs and a splash of chilli sauce. Fresh baby spinach, grilled eggplant, oven roasted capsicum, sun-dried tomato and fetta cheese. Shaved ham, baby spinach, sun-dried tomato, kalamata olives, roasted red capsicum, fetta cheese, garlic and chilli. Spanish onion, diced tomato, spring onion, fetta cheese, dressed with balsamic vinaigrette and fresh basil. Chicken breast, spinach leaves, Spanish onion, basil pesto sauce and fetta cheese. Sweet potato, grilled zucchini, spanish onion, sweet chilli sauce, feta cheese. Mushroom, roasted red capsicum, Spanish onion, chicken, peri peri sauce. Traditional folded pizzas. 1 size only 11 inch folded. All dressed with basil and olive oil. Traditional folded pizzas, 1 sizes only 11 inch folded and All dressed with basil and olive oil. 4 Balls served with chips. Home-made pasta. Mix any pasta with any sauce. Bacon, egg, spring onions and creamy cheese sauce. Hot salami, roasted red capsicum, olives, chilli and napoli sauce. Mixed seafood, spring onions, garlic, white wine with your choice of napoli or olive oil sauce. Mushrooms, spring onions, cream sauce. Basil pesto, broccoli, white wine, roasted red capsicum, Spanish onion in cream sauce. Bacon, mushrooms with avocado in cream sauce. Bacon, roasted red capsicum, Spanish onion, chilli in napolitana sauce. Chicken, mushrooms, spring onion in creamy curry sauce. Chicken, zucchini, roasted red capsicum and garlic with cream and napoli sauce. Eggplant, spinach, roasted red capsicum, black olives in napolitana sauce. Chicken, avocado in a cream sauce. Chicken, cherry tomato, mushroom, bacon in a cream sauce. Homemade meatballs, onion in napoli sauce. (Available in small only) Alternate layers of pasta, cheese and bolognese topped with bechamel. Available in BBQ, plum or honey soy sauces. All ribs and wings served with spuds.